"My Elizabethan collar makes me quite the trendsetter." If Spike has a boo-boo, he might end up attacking that annoying bandage he has to wear. Little does he know that his actions can undo stitches, trigger an infection and prolong his healing. 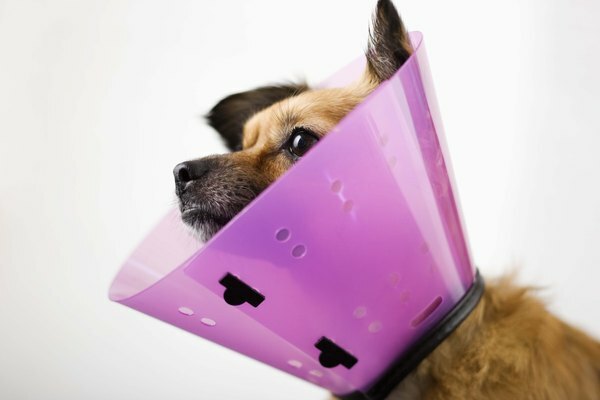 As his doggie parent, learn how to protect him from himself and keep his wound safe. Apply a taste aversion to the top of the bandage. Use a commercial taste deterrent, cayenne pepper, hot sauce or aloe gel. Make sure the deterrent doesn't come in contact with the wound. When your furry friend bites on his bandage, the disgusting taste might make him think twice about repeating his actions. Startle your dog the moment you catch him biting on his bandage. Arm yourself with an empty soda can that's partially filled with pennies and taped shut. Watch your dog closely, and when he starts nipping at his bandage, shake the can. The loud noise will startle him and stop him in his tracks. Give him a dog toy to redirect his attention. With consistency, he might stop messing with his bandage just to prevent the startling noise. Cover the bandage so your dog can't bite it. If your dog's bandage is on his abdomen or chest, use a T-shirt to cover it. Pull his front legs through the arm openings and his head through the neck opening. Cut three circles in the T-shirt for your dog's tail and back legs. Alternatively, buy a dog jacket and put it on him. Deny your dog access to his bandage. Put an Elizabethan collar on your dog. This funnel-like, plastic contraption extends outward from your dog's neck and makes it so he can't touch his own body with his mouth. Remove the collar during feeding times, because otherwise your dog might not be able to reach his bowl. Consult your veterinarian about leaving the wound uncovered, because some wounds might heal faster without a bandage. Can a Cat Land on Its Feet Without a Tail?